Celebrating rich, buttery, over-the-top treats, award-winning baker and author Judy Rosenberg shares 150 inspired but easy-to-make cookie recipes that never stint on the good stuff. 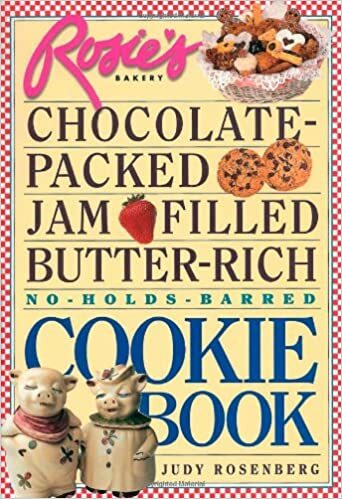 Think chocolate chips and chocolate chunks, mounds of jam and heaps of nuts, the butter crunch of real shortbread and the tender chew of a gooey bar. Cookies and milk will never taste the same again. Among the old favorites and new classics: Noah's Chocolate Chocolatey Chocolate Chips, Hazelnut Crisps, Banana-Nut Chocolate Chunks, Almond Biscotti (low-fat, but don't tell anyone), Coconut Dainties, Pucker-Your-Lips Apricot Linzer Bars, and adorable little custard-filled Boston Cream Pies.